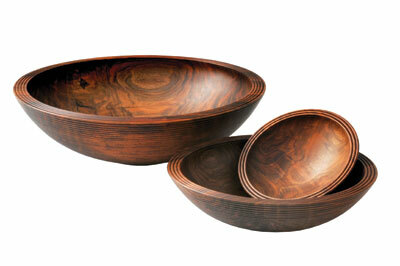 The Oyster Bowl, eucalyptus, 440mm dia. It was with some excitement that I was contacted and asked to arrange a visit to the workshop of Dave Appleby, a woodturner who I first met a few years earlier at a local woodworking show. On first meeting Dave two things immediately became apparent, the first being the quality and beauty of his work; the second how helpful and genuinely unassuming he is. Throughout the short time I have known Dave he has always been willing to share his knowledge and help those around him in whatever way he can and is often seen at shows surrounded by many aspiring and well established turners as they watch him work, with him often stopping to happily answer any questions. It did not take me long to realise that Dave has a deep passion for wood and turning, and that he pays great attention to detail, form and finish, producing work that is beautiful to the eye and tactile to the touch. So with notebook in hand and camera packed I drove to meet Dave at his home and workshop in a picturesque Somerset village. 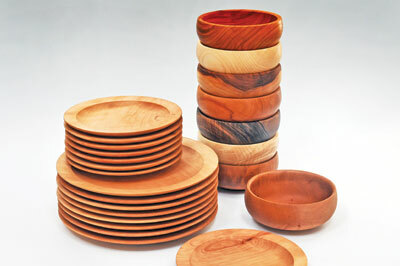 On being invited into Dave's home I could see that wood is a large part of his life, with beautifully crafted bowls, platters and ornaments being displayed in prominent places. Dave was more than happy for me to pick them up; they were all beautifully produced, impeccably finished with his eye for line and form being masterful. Dave grew up with his grandmother, mother, father and brother in Chard, Somerset, England, next door to an elderly man called Harry Rosier: "Harry had spent some of his life as a World War I engineer and as such had a well-equipped workshop that he allowed my brother and I to use. Here we spent many happy days making bows and similar toys in wood and I found a passion for working with wood," he tells me. It was a sad time when Harry passed away but he left all of his tools to Dave and his brother, with which Dave carried on his interest in working with wood. Dave attended a local school and on leaving went for an interview at a local bank: "And so started my career as a commercial banker where I stayed for the next 33 years," he explains. During this time Dave continued with his passion for wood: "I set up a small workshop at my home with my first lathe machine being a Black & Decker drill lathe. I would escape to my workshop whenever I could to relax and often talked with my wife, Sandie, about working with wood full-time," he says. 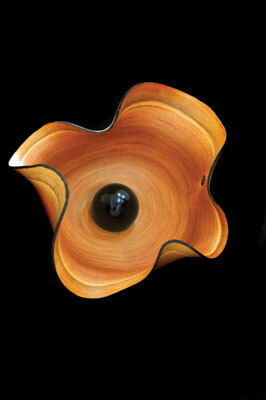 At the age of 52, he decided to take early retirement to follow his passion in wood as a full-time vocation concentrating on his turning: "Soon my work was accepted into galleries and with sales becoming regular I decided to turn full-time and I'm pleased to say that my work has gone from strength to strength ever since. I went full-time in 2001 and in 2004 was accepted onto the Register of Professional Turners (RPT), supported by the Worshipful Company of Turners, London." He is also a member of the Somerset Guild of Craftsmen where he is involved on the management committee of the Courthouse Gallery. Dave sells his work through numerous galleries, via private commissions and repeat customers as well as teaching at his workshop and demonstrating the craft around the UK at shows and woodturning clubs. Dave is passionate about the wood being the central aspect of his work, opting to allow the beauty of the wood grain, colour and texture to influence the design of the items he produces: "The provenance of my pieces and the wood I use is also very important. 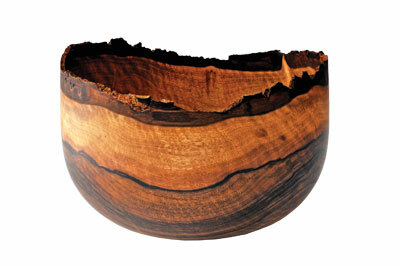 As such, I source local hardwoods through a network of contacts and like to collect and process the wood myself. This gives me full control over the whole process of each piece produced and is fundamental to the way I work and sell my work," he explains. As a general rule Dave starts all his pieces by rough turning unseasoned wood which is then stored oversize until dry, although he also turns eucalyptus and other woods to finish with a thin wall to allow the natural movement to produce many spectacular pieces. It was interesting to find after I asked Dave if he had any special ways of seasoning to hear that he does not place his rough turned work into paper or plastic bags and only ever seals the end grain of pieces produced from wood he knows from experience is susceptible to cracking such as oak (Quercus robur), the rest is simply stored in racks in a cool draft free place. Dave works solely in native and homegrown UK timbers: "I particularly enjoy working with yew (Taxus baccata), walnut (Juglans regia), beech (Fagus sylvatica), English oak, ash (Fraxinus excelsior) and eucalyptus to name a few," he says. After a cup of tea and a few biscuits served on one of Dave's beautiful walnut plates, I was taken into his storage/seasoning room, where I saw many finished and rough turned items. This space is used for the storing and seasoning of his work and is as well decorated and organised as any office space, and to date is the finest store room I have ever seen. It was evident that Dave cares greatly for his work right from collecting the wood to delivering finished items to his customers. The room housed numerous shelves for roughed work, none of which as previously described, were wrapped in anything other than the still cool air of the room. "In addition to these I have a Creusen slow speed bench grinder on which I have placed a 50 x 200mm white wheel and a Tormek sharpening system. I have also installed a main/direct air extraction system with ducting to all the machines; this is also central to the workshop as well as several ambient air filters, one either side." The wall space is used to house turning and other tools with the whole workshop being well organised with surprisingly few tools present. Dave informed me that his favourite and most used turning tools are a long-grind bowl gouge of which he removes the heel on the grinding wheel. 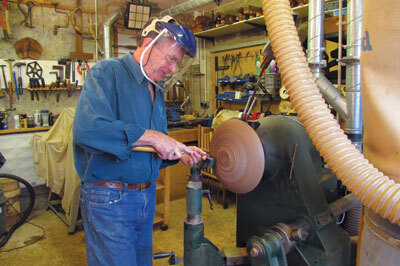 He clarified that removing the heel allows for the tool to smoothly produce the inside of a bowl without leaving marks which can occur if the heel rubs: "My other favourite tool is a traditionally ground bowl gouge which I use for finishing, and such a fine finish can be achieved straight from the tool," he tells me. Dave also showed me a number of homemade beading tools that he makes from suitably strong chisels and has several to suit the different sized beads that he produces on the outside of his bowls and other work. Having watched Dave several times at shows I can describe his turning style as calm and efficient, making it look effortless and if you ever get a chance to watch him turn, I am sure you will, as I have, learned some time tested tips. When I asked Dave about his aspirations for the future, he commented that he would like to continue with more of the same work, but would also like to develop the use of darker native timbers combined with the application of gold leaf. 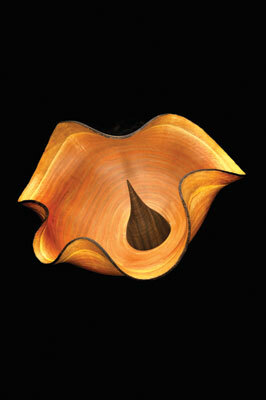 He continued by saying that he will keep promoting the beauty of wood as an art form in itself. It was a pleasure to be invited into Dave and Sandie's home and to interview him for this article. I highly recommend viewing his beautiful and inspiring work via his website. 3. An understanding of form to include proportions and profile and whether I want closed or open forms - footed or not. A big subject but it is so interesting! 7. Giving my children the rejects!